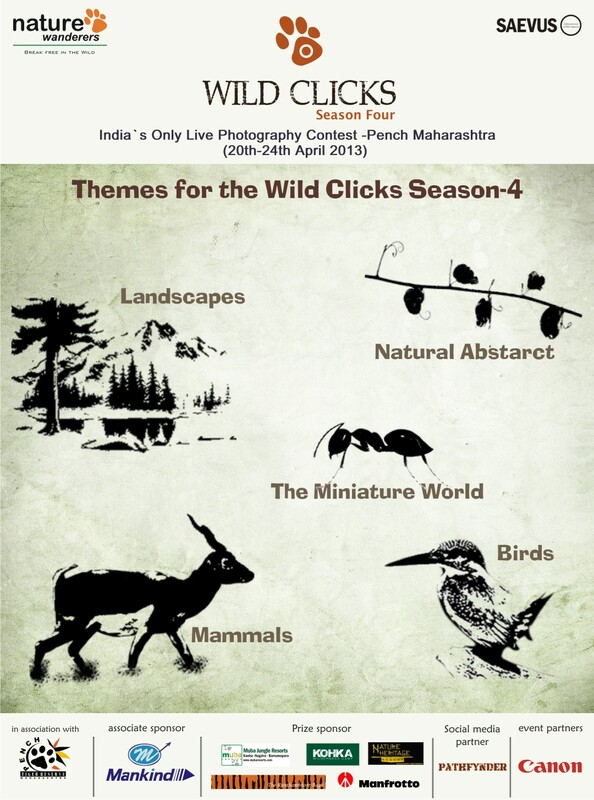 Wild Clicks-4, India’s only live photography contest has taken off with immense chill and thrill on 20th April, 2013 at Pench Maharashtra. After 3 back to back highly successful seasons in Corbett, Ranthambore and Kanha. 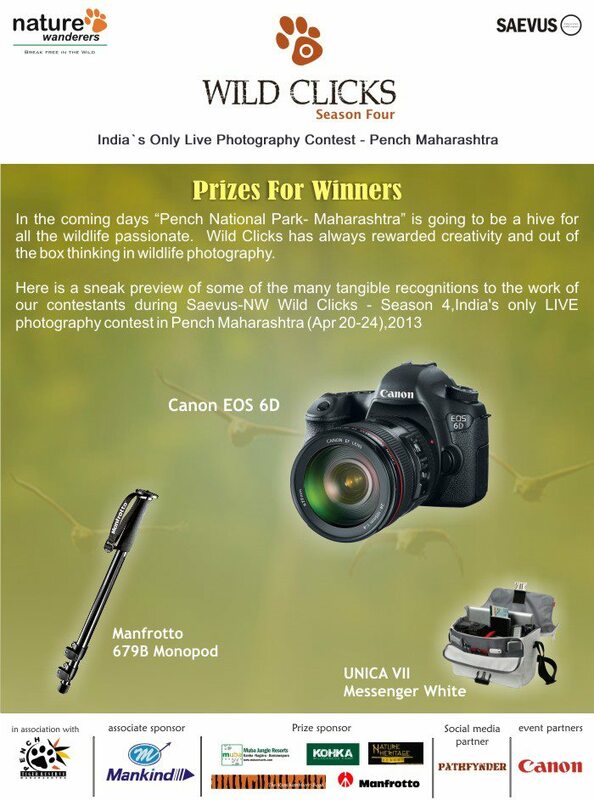 Pench Tiger Reserve Maharashtra in association with SAEVUS – Nature Wanderers announces the launch of Wild Clicks – Season 4 at Pench National Park (April 20-24, 2013). 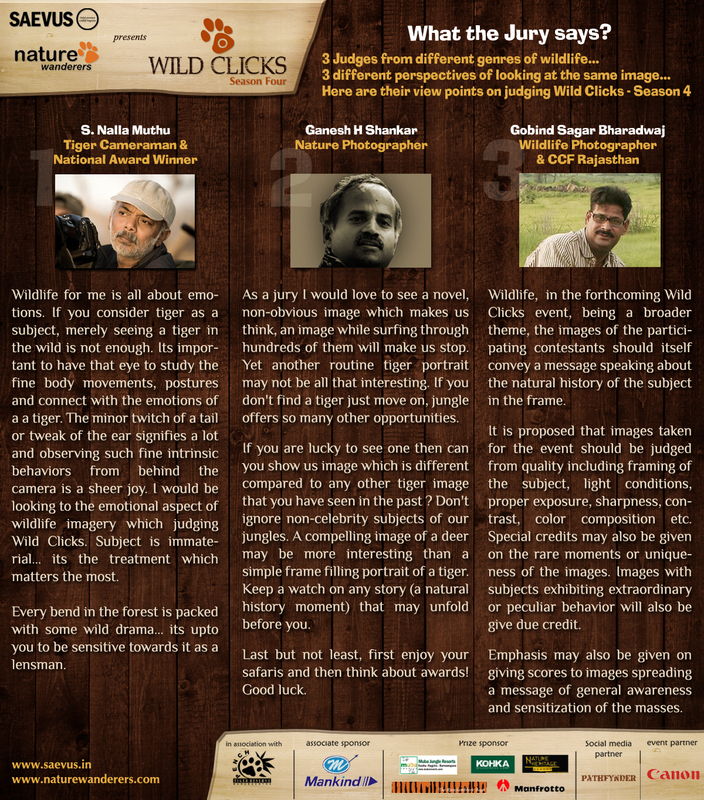 Conceived and developed as an annual wildlife property by Nature Wanderers, Wild Clicks is one of the most exciting and thrilling wildlife photography competitions to be a part of. The contest will be judged by a panel of three; Mr Nalla Muthu, cinematographer and the Tiger man of India, Mr. Ganesh H Shankar, India’s most creative natural history photographer and Gobind Sagar Bharadwaj, Senior forest officer. Nature Wanderers is India’s pioneering nature photography training organization that aims to spread awareness about environmental conservation through innovative means – primarily photography. Over the years, Wild Clicks has grown as a competition and has always believed in giving proper recognition to the work of their contestants in some or the other way hosting number of prizes. The entire coverage of this five day event was captured for our client Nature Wanderer by team Pathfynder from the remote location of Pench Tiger Reserve. The coverage includes content development, creative designing, live updates from the remotest of remote venue of Pench Tiger Reserve facing all the challenges.